The Alhambra seen from the Albaicín. Photo: Ana Laya. Granada is definitely one of my favourite cities in Spain (it’s currently in the Top 3) as it’s almost perfect, and I say almost just because I’m a sucker for the ocean, my perfect city should be by the sea. 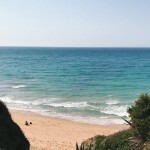 Granada, does not have the sea right there, but it’s really really close. If you take your car you’ll be in the Costa Tropical in just one hour, and the same goes for the snowy mountains of Sierra Nevada. 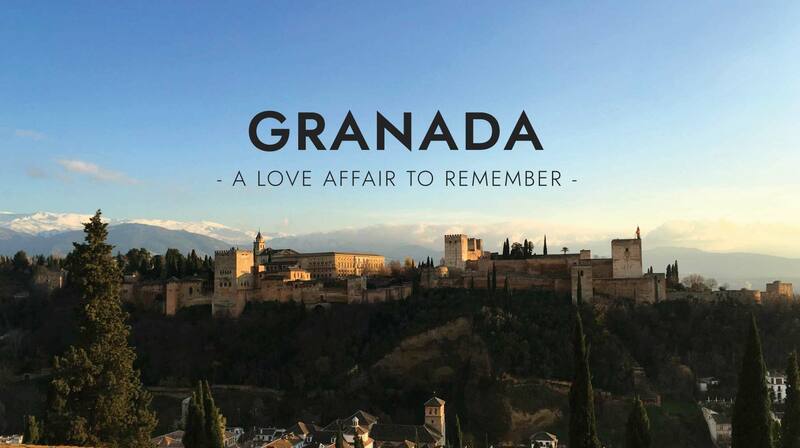 On top of being blessed with an amazing geographical location, or maybe because of that, Granada also has been a key place in History. 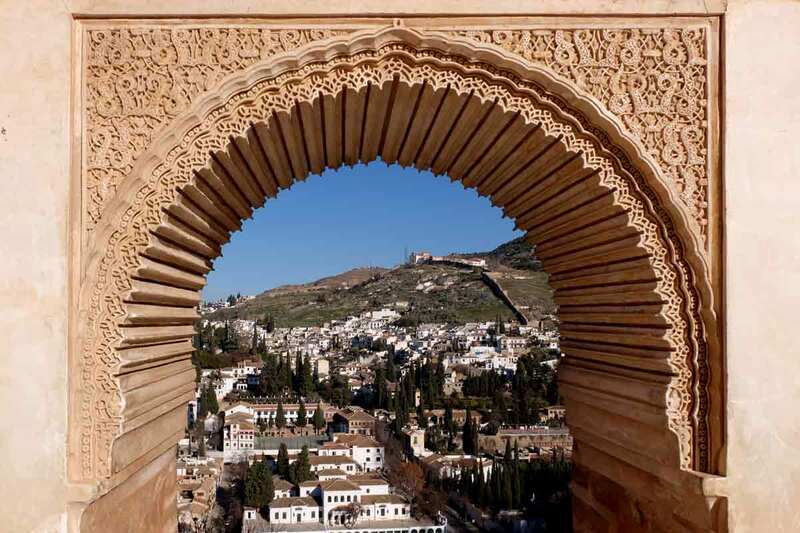 Granada’s historical name in the Arabic language was غرناطة (Ġarnāṭah) and they say it probably means “hill of strangers”. The Umayyad conquest of Hispania, started in AD 711, and brought large parts of the Iberian Peninsula under Moorish control and established Al-Andalus, that lasted until the early 11th Century officially becoming the Emirate of Granada in 1238. 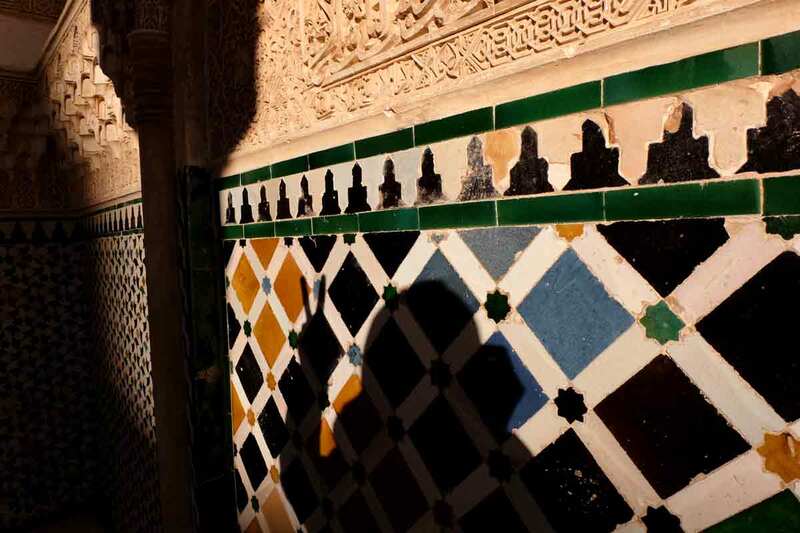 The result of those centuries of cultural exchange left an amazing architectonical legacy including the wonder that is the Alhambra… you really have no idea how amazing and magical that place is until you visit it. 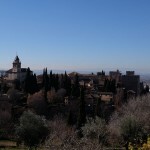 That’s why probably visiting La Alhambra is number one in your to do list in Granada, right? 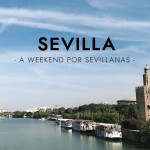 Let me show you around a couple of (maybe) not so popular places that definitely worth a visit for you to enjoy the food, drinks and the beautiful and happy people that call this place home. I guarantee that you’ll fall in love with this city. 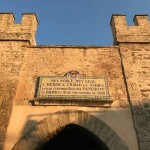 This 13th-century Moorish palace belonged to Axa, the mother of King Boabdil. It features a qubba, or reception hall, of great architectural value and some original excavations. 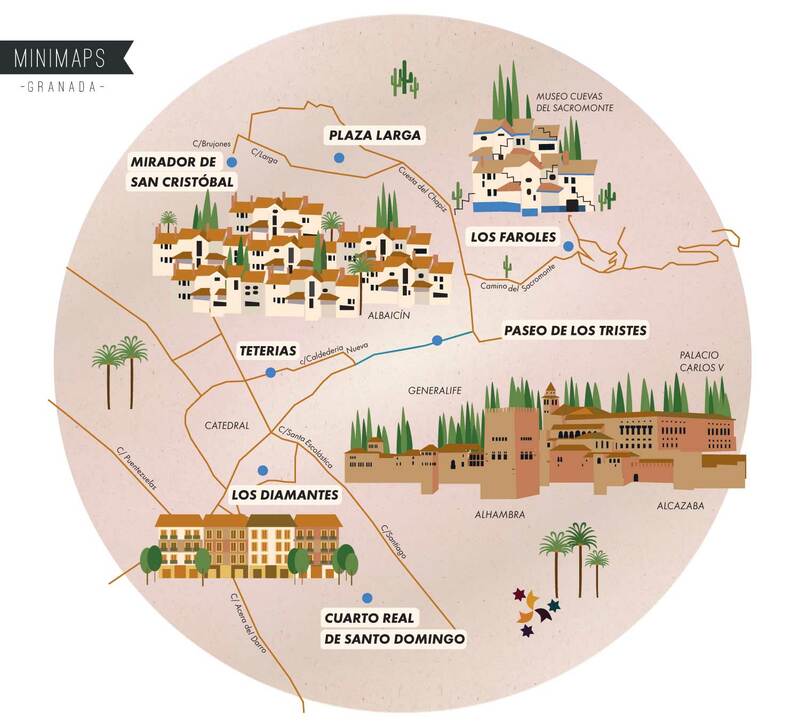 Definitely not the most well-marked spot in Granada, we bump into it by mere chance and it turned out to be a really peaceful place with a bit of islamic history, lovely gardens and from time to time it hosts contemporary art or history exhibitions. Not as breathtaking as the Alhambra but it’s a lot easier to visit and it very well deserves it. Massive generous tapas, fresh and delicious seafood in a packed but ultra nice ambience. That’s Los Diamantes. 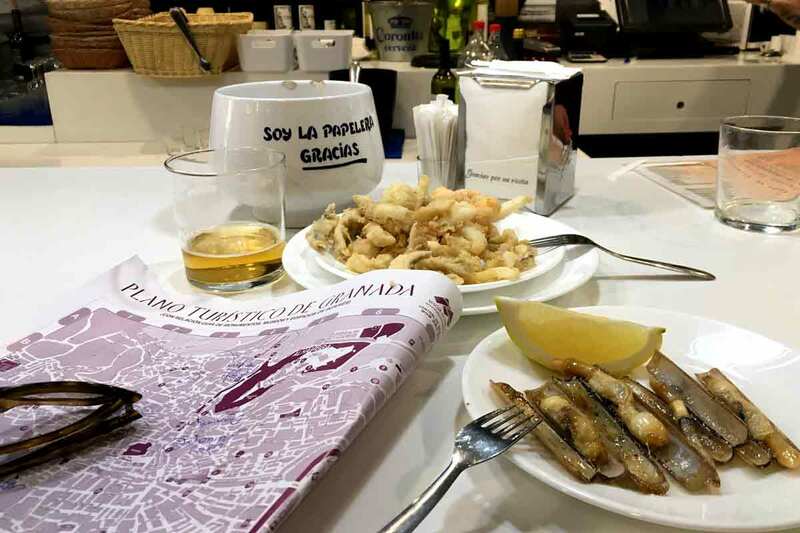 There are two: the first one, a smaller one in Calle Navas 28 (since 1942) is the most picturesque one, but after you’ve visited that one you can go to straight to eat to the one in Plaza Nueva 13. Same flavour and generosity in a more spacious place. Perfect place to cool down and do some minimapping. Los Diamantes, oh how much we miss you! 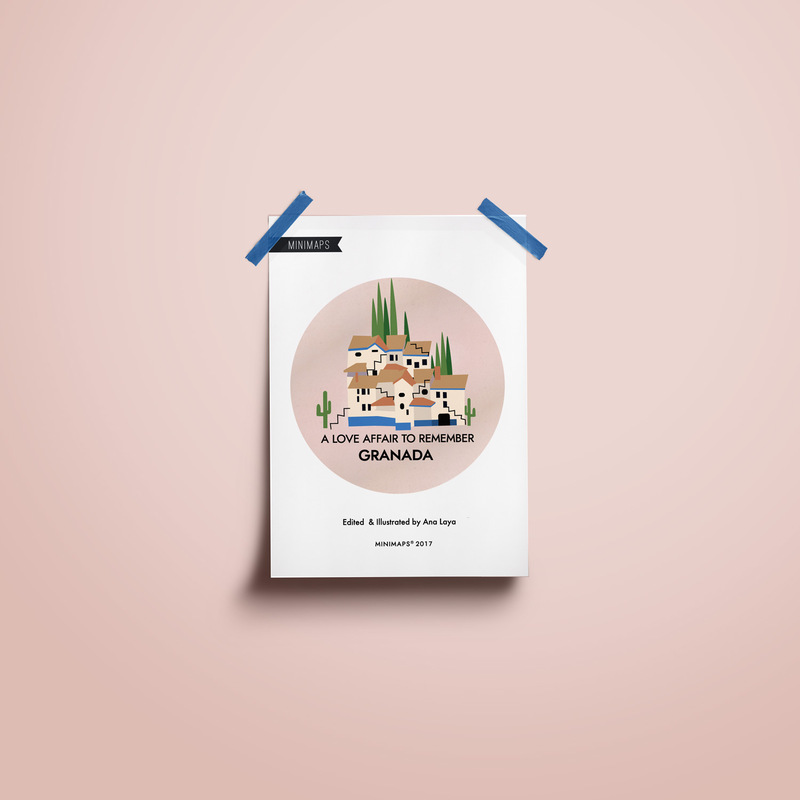 By the end of the 11th century, the city of Granada had already spread across the Darro River to reach the hill of the future Alhambra, and that included the wonder that is the Albaicín neighborhood (that is a World Heritage site). One of the traditions inherited and preserved from the Andalusian Islamic times is tea. 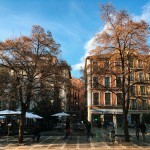 And around the Calderería Nueva street (also called Calle de las Teterías) you’ll have a galore of Tea Rooms to chose from. 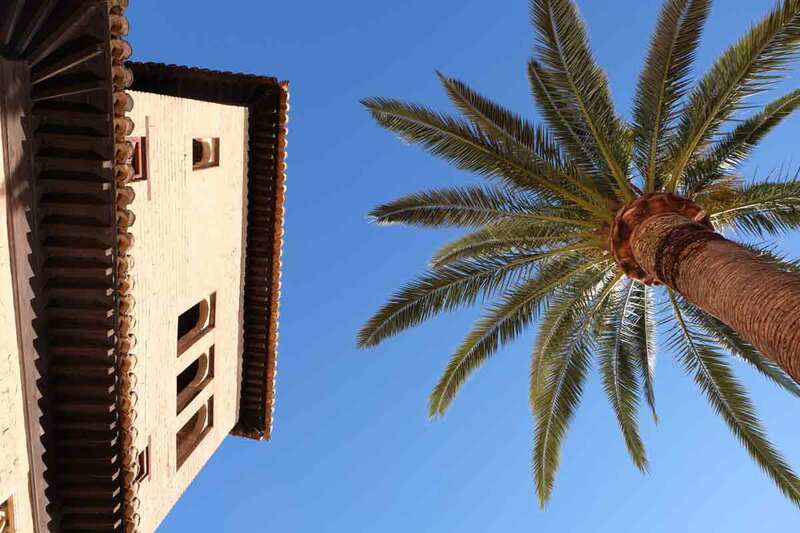 Many styles, all pure charm and many young people, both native Spanish and foreign including many students as Granada is an important University City. I love this area, if the sun is shinning this is the best place to enjoy the sun and some beers. 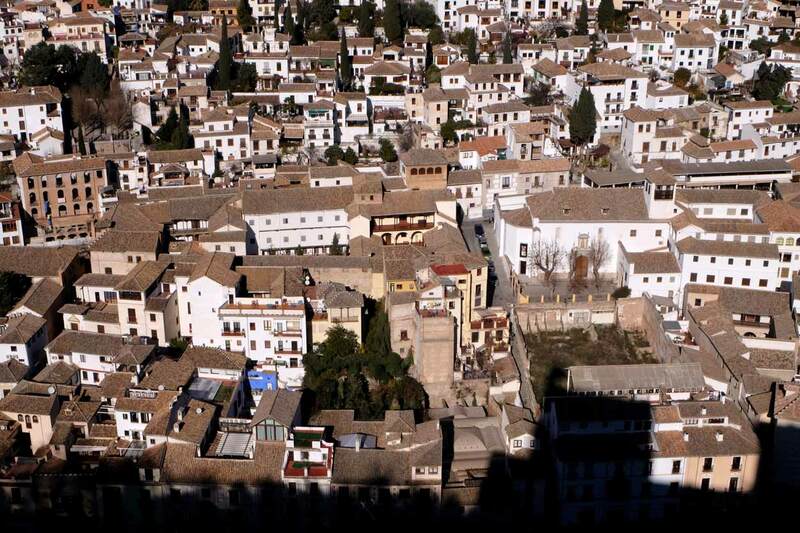 It’s hard to be sunkissed in Granada because of the tangled nature of its streets but here, next to the small water stream of the Darro River, there are many terraces with enough sun for everyone. Enjoy! The Albaicín from the magnificent Alhambra. Photo: Minimaps. 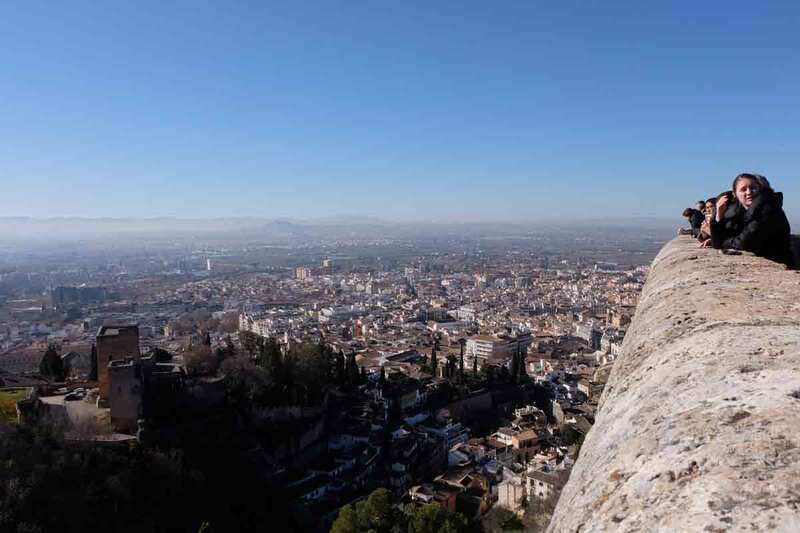 When going up the Albaicín you’ll always have the omnipresent Alhambra right on your back and that sight is definitely magnificent and you can enjoy it from the Mirador San Nicolás, but if you also want to have a look at the city this Mirador is the place. Right before sunset, as usual, is the recommended time to get there. The Albaicín view from the Alcazaba with a bit of Alhambra’s shadow. Sacromonte, up there on the top of the hill where the gipsy’s caves are is of course the place to see Flamenco, that is a well known fact, and you definitely should go there to explore as it is a completely different feeling and a scenery made of tiny streets, museums, caves and alleys. 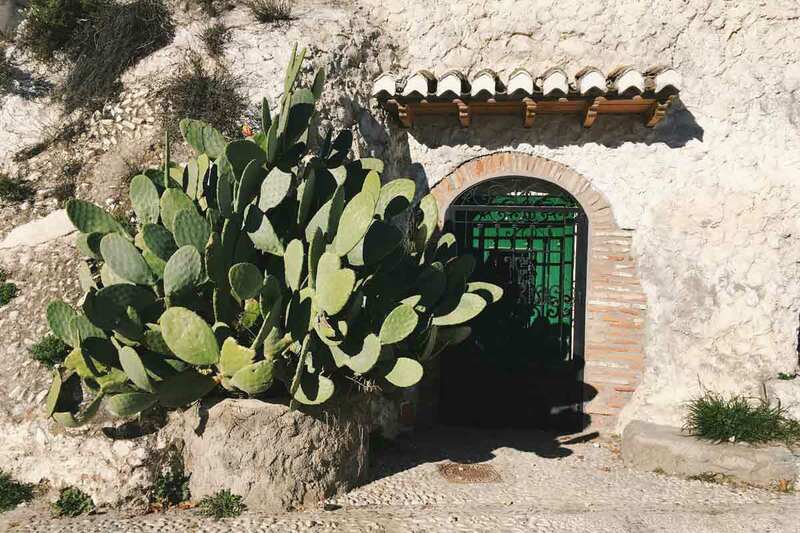 What you may not know is that there’s a mini-cave called Los Faroles with just a bunch of chairs outside on the terrace, about the space to fit 8 to 12 people, a very limited menu, but containing the maximum amount of stories per meter square. Let’s start with the owner, his name is Romántico (yes, romantic) and his cave is definitely a very special place, part-bar, part-museum, part-old grandpa’s basement filled with a bunch of objects and anecdotes he’s super willing to share with you. You’ll probably recognise him as he’ll be dressed in a shinny suit (as Michael Jackson, he says). Please, send him my regards! 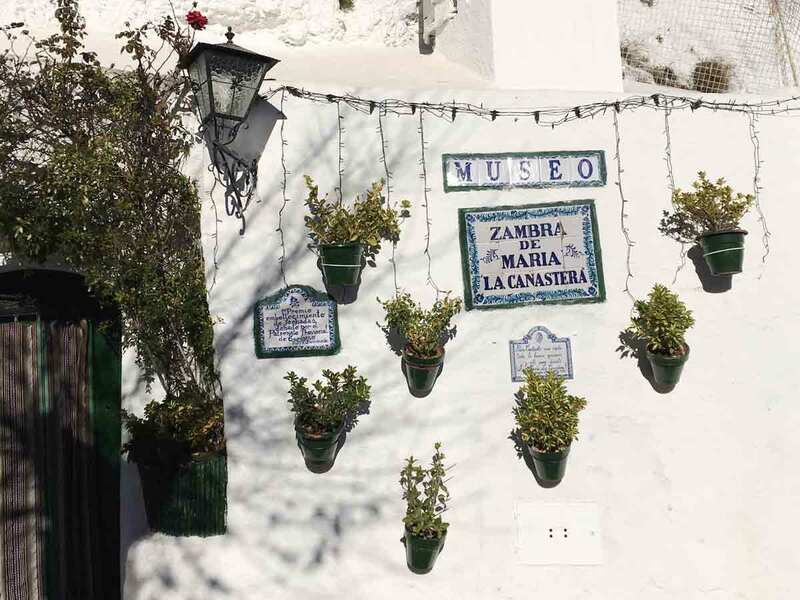 Sacromonte is simply another world! Photo: Minimaps. 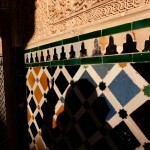 If you want to see more photos and read some useful tips on how to get to the Alhambra, have a look at this blog post. And if you’re ready to fall in love, please download your minimap here! Hi there! Did you know that Escher got inspired by the Alhambra tesselations and spend years studying them? | Photo: Ana Laya. Look up! Also Alhambra, the central patio via the Generalife. 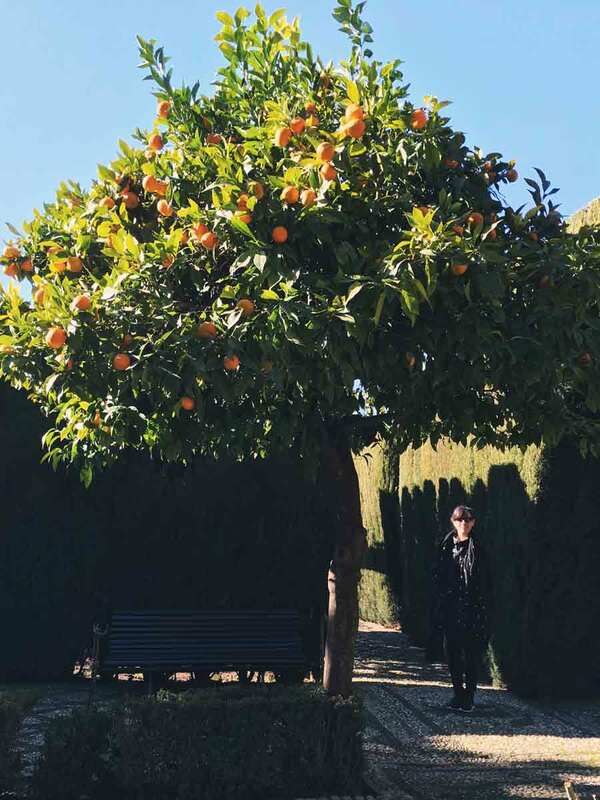 That’s me standing right next to one of the ubiquitous and cute orange trees in Granada. This one is in the Generalife, the place that made me discover that when I grow up I really want to be a Sultana. Sacromonte is a universe in itself. So many places, so little time. 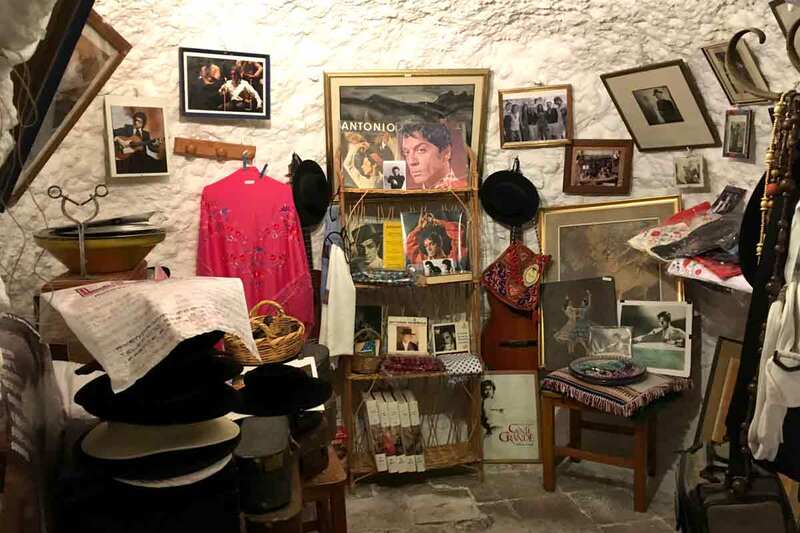 One of the spaces in Romántico’s art cave @ Sacromonte. Granada City view from the Alcazaba.